After 2 Inductions, Mom has a Super-FAST Homebirth with Her 3rd! 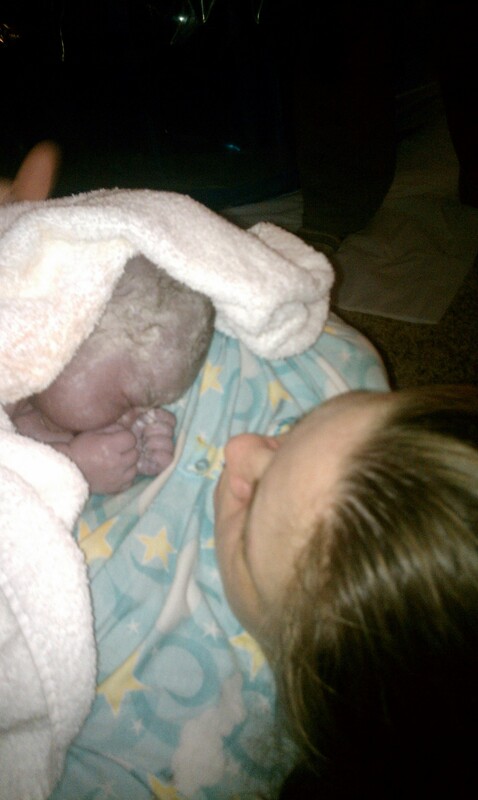 Thanks to Janell from the Hypnobabies Yahoo Group for sharing her birth story! I think it was around 6:00 pm I went to the bathroom and noticed I lost a small amount of mucous plug. I tried to not get my hopes up. By this time my waves were pretty regular, but nothing to set your watch by, coming every 5-10 minutes or so with more pressure than normal. Looking back, I should have realized this was it and started listening to my Hypnobabies tracks. I was in denial! 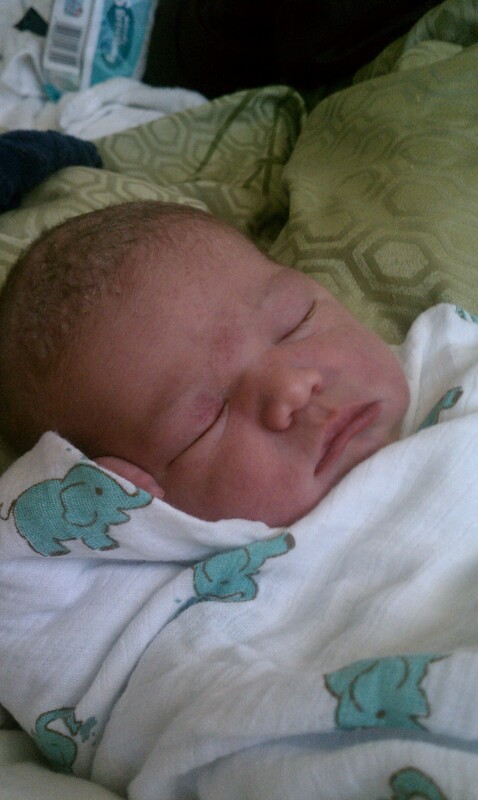 Plus, my DH kept telling me I wasn’t really in my birthing time. Pffft. Despite all of the denial, I had a strong sense of urgency that DH needed to go get our last minute things from the store. So I sent him off thinking it was probably for nothing, but better safe than sorry. This was around 9:45 pm. Almost right after he left my waves started coming every 5 minutes with much more intensity than before. I thought it was no big deal. You hear about prodromal labor all the time. They kept up for about an hour and I started thinking it was real. I listened to my Hypnobabies birthing day affirmations and then tried to listen to the easy first stage track, but the waves were too intense to focus by then. This was around 10:50 or so. I realize I’m in my birthing time for sure, haha, and DH is gone!! At this point I head into the bathroom to pee. I didn’t come out for an hour, maybe a little more. Just from my walk to the bathroom and using the toilet, my waves went from five to two minutes apart, and were VERY intense. I was now low moaning and rocking on the toilet to cope. I knew I was in transformation. I was shaking, feeling hot and cold simultaneously somehow, and feeling nauseous. I also started feeling somewhat “pushy”, which made me nervous. I was still alone! But I stayed relaxed in between waves, thank goodness. I began texting DH telling him I needed him home but his phone had died, lol. He got back around midnight and I came out of the bathroom shortly after. I never wanted to leave the toilet. Since this was all happening so fast I never thought to call my MW. So as I leaned over my birth ball and moaned, DH called (at 12:08) and told her I’d been having birthing waves every two minutes for over an hour. She hung up pretty quick! I tried being on hands and knees for a few waves because of the discomfort in my back, but it was too much. So I moved to a sitting position in an armchair, trying to mimick the toilet, but that was too much too. I just wanted to lay down. I was hesitant to do it since everything you read says movement helps but I laid down on my left side on the couch anyway. This is where I stayed. I was having to vocalize more loudly as the pressure was super intense. Still, I was able to relax completely in between waves. I wasn’t talking, smiling, or laughing, but I was still, and relaxed. I began to feel very pushy but resisted since my MW wasn’t there yet. This made it harder but it was ok. At one point my body pushed involuntarily and I yelled to DH “I’m pushing!”. I really thought we’d be having an unassisted birth at that point. My MW got there around 1:00 am and I told her I was feeling pushy. We waited out some waves and then she checked me (my first check the whole pregnancy:)) and there was only a lip of cervix left. She knew I wanted a waterbirth so she and DH tried to get the pool set up, bless their hearts. I knew there wasn’t time. I think one of her assistants got there around the same time…not really sure. The timeline is blurry for me here. They were busy getting their supplies ready while I was on the couch, pushing whenever my body felt the need, when my membranes ruptured. The biggest pop ever and SO much fluid. It was crazy….like out of a movie. It wasn’t long til baby’s head was crowning. DH missed the head being born because our 2 yr old woke, so he went to tell him everything was alright, but he made it in time to see the rest of the birth. The birth happened so fast. I remember my MW telling me to breath and slow down to allow my perineum to stretch, and I tried, but just couldn’t. It wasn’t *painful* per se, but I definitely felt the stretching! Once the head was born the body came out just as fast. I think the other assistant got here five minutes after the birth. Oh, I made it out unscathed! No tears or anything! I could have been more comfortable maybe had I realized sooner that I really was in my birthing time, but it all worked out.